Computer viruses are some of the most dangerous of all cyber threats. They can hold your files to ransom, steal your passwords or bank details, or slow your computer to a crawl. Thankfully with just a few simple precautions you can dramatically reduce the risk of infection. How can I avoid getting a virus? Viruses are unwanted & dangerous software programs. The damage they do could be anything, such as holding your files to ransom, capturing your passwords, stealing credit card details, or even using your PC as a slave to attack others. It's often scary to think about viruses - they've rightly got a nasty reputation - but they're not as common as might be believed. And by following a few simple steps you can reduce your chances of being infected. How do they get onto my computer? Keeping your computer safe relies on a combination of trying to avoid exposing your computer to viruses in the first place, making it difficult for them to install themselves, and detecting them when they do. We'll get onto explaining this below. 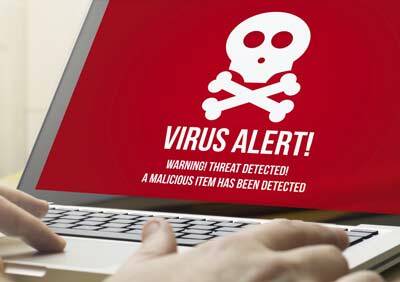 Viruses vs Malware - what's the difference? Over time you might have heard various different terms and wondered what the difference is. Malware, trojans, worms, spyware - what do they all mean? Malware ("malicious software") is the catch-all term for any program that can do harm to your computer. Viruses are a specific type of malware, along with worms, ransomware, spyware, trojans, & several others. The differences between them are in how they spread, what they infect, and what they do - see our Glossary page for details if you're interested. The difference between all of these terms rarely matters - just know that they're all bad! We'll keep it simple & use the word 'Virus' throughout this page to describe all forms of malware. Be assured too that - despite their name - antivirus products treat all forms of malware and not just viruses. Don’t open attachments in unexpected emails. These are one of the most common ways for viruses to spread. Update your DNS settings. By changing the 'address book' that your computer uses to find websites you can avoid accidentally visiting many malicious sites. > Read our Phishing guide for advice. > Learn about blocking malicious websites. Keep your software up to date. This is a bit like a sticking plaster - your computer may come into contact with germs but if they can’t get in then they can’t infect it. > Learn how to keep software up to date. Install an antivirus program. These are your last line of defence, looking for and defending against any suspicious activity on your computer. > See our tips for buying & using antivirus software. Think your computer already has a virus? If you think your computer may have a virus then don’t panic! Most viruses are easily dealt with - just follow these straightforward steps to clean up your computer. HELP! WHAT DO I DO IF..? © 2019 InfoSec360 Ltd. All rights reserved.